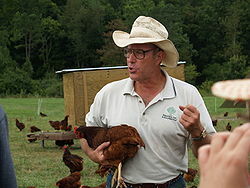 Joel Salatin, the farmer and author, gives a free talk about his book, “Folks, This Ain’t Normal”. Hailed by the New York Times as “Virginia’s most multifaceted agrarian since Thomas Jefferson [and] the high priest of the pasture” was profiled in the Academy Award nominated documentary “Food, Inc.” and the bestselling book “The Omnivore’s Dilemma”. He discusses how far removed we are from the simple, sustainable joy that comes from living close to the land and the people we love. He offers practical and philosophical ideas for changing our lives in small ways that have big impact.